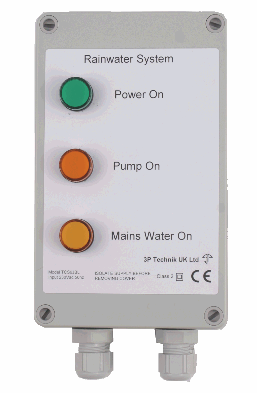 The TCS7JBL Top-up Switch connects to a pressure switch and float switch at 24VDC low-voltage to control both a pump and mains water top-up solenoid at 230VAC, maintaining the correct pressure in direct feed rainwater systems and ensuring mains water is added to the tank as needed for continued operation in dry weather. The pump will be activated when a connected pressure switch closes, indicating a drop in pressure in the feed to the building. Mains water will be added as needed via any 230VAC solenoid valve when a connected float switch activates within the rainwater tank. Adjustment of fill volume is achieved by altering the free length of cable attached to the float switches. System pressure is adjusted at the pressure switch. Front panel indicators indicate the correct function of the 230v power supply (green), and provide activity status of the 230Vac pump output (amber – middle), and of the 230Vac solenoid valve output (amber – lower). Float switch and solenoid circuits are both powered by 230VAC, both inputs are run at a safe 24VDC. Control of 230VAC devices by a low voltage control circuit rather than direct attachment to the sensors enables long float switch distances to be achieved without the detrimental effects of voltage drop usually encountered when mains voltages are switched using long cable runs to float or pressure switches. This product requires a 230VAC supply, pump and solenoid valve, and a pressure switch and float switch, and a pressure vessel.